Here is a unique opportunity to acquire an entire set of T1 pens. They are being sold individually or as a set. The T1 was only made one year 1969. Parker lost money on each one made. They are all solid Titanium. These all have the correct red tassies. Parker Red and Black Mottled Hard Rubber 18. Great imprints and condition. Early Lucky Curve Nib and good feed. Slip Cap, ED EXC Cond. $295. Conklin #4 Filigree Slip Cap. 1912. 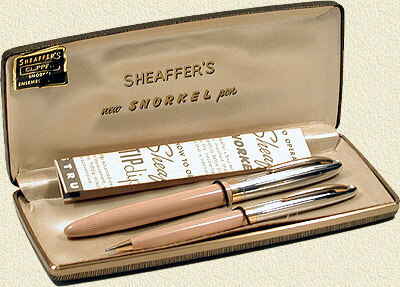 Filigree Conklin pens in this size are extremely difficult to find. The early slip models are the scarcer than the screw cap versions. This is a very clean example. No brassing and the BHR is black and shiny. It has the correct unmarked crescent and the wide flat lock ring. It has one dent in the top of the cap that doesn’t detract much from the beauty of this pen. GFT, fine flexible nib, 5 & 1/2 inches capped EXC $1500.